We’d love your help. 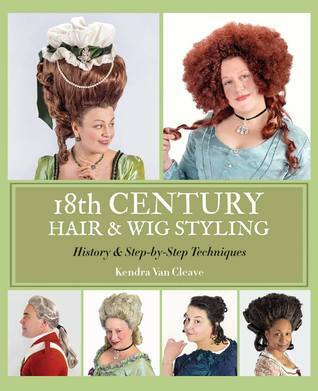 Let us know what’s wrong with this preview of 18th Century Hair & Wig Styling by Kendra Van Cleave. This book combines meticulous research with easy to follow instructions that will help you create historically accurate hairstyles of the 18th century. The book includes a detailed history of men's and women's hair from 1700 to 1799: which styles were worn when, as well as how hair and wigs were styled. It provides practical techniques for styling hair and wigs that will b This book combines meticulous research with easy to follow instructions that will help you create historically accurate hairstyles of the 18th century. The book includes a detailed history of men's and women's hair from 1700 to 1799: which styles were worn when, as well as how hair and wigs were styled. It provides practical techniques for styling hair and wigs that will be useful to anyone who wants to learn more about historical hairstyling, from beginners to advanced users. Step-by-step instructions show how to create 25 individual hairstyles -- 22 for women, and 3 for men -- that span the century, and suggestions are included for ways to vary the different styles. To ask other readers questions about 18th Century Hair & Wig Styling, please sign up. I seriously can't say enough good things about this fantastic new resource volume for historical and theatrical costumers. It's a full-color, 298-page, 8"x10" book, very professionally produced and packed full of fantastic information about a range of 18th century hairstyles, including those intimidatingly-large "Marie Antoinette" styles. Ms. Van Cleave is a costumer, yes, but she is also a fashion historian and academic librarian, and the depth of her research and knowledge really shines through I seriously can't say enough good things about this fantastic new resource volume for historical and theatrical costumers. It's a full-color, 298-page, 8"x10" book, very professionally produced and packed full of fantastic information about a range of 18th century hairstyles, including those intimidatingly-large "Marie Antoinette" styles. Ms. Van Cleave is a costumer, yes, but she is also a fashion historian and academic librarian, and the depth of her research and knowledge really shines through in the first section of the book, on the history of the styles in question. It's clear that she's not only done exhaustive research on hair of the period, but also tracked down and reproduced a wealth of visual research from portraits and other paintings, fashion plates, and illustrations of 18th century primary sources. The second section of the book is called Techniques, and focuses on the practical terms, tools, products, and so forth needed to create these styles. If you have little or no experience styling hair and/or wigs, this section will get you up to speed on not just the basics, but also topics like making your own wefts, adding hair into wigs, creating structures/foundations/rats, and so forth. It also includes info on powdering hair and wigs, and a lot of great photographs documenting the styling methods discussed. The third section, Finished Styles, is the most exciting step-by-step how-to overview of exactly how to do 22 different ladies' styles and three men's. If you've done much historical research on hairstyles of the 18th century, you'll recognize some of the most iconic ones (giant ship atop giant hair, anyone?). These are shown in a tutorial layout--instructions and photographs illustrating each step of the way, from an initial photo showing the model's actual unstyled hair and/or the unstyled wig beforehand, through to the finished look. There's an extensive bibliography, a list of sources for wigs as well as style/product names for those used in the projects depicted, and even a tutorial on making a wig bag for men's styles that need one.